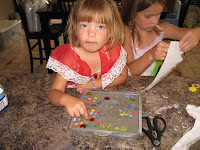 Yesterday we made stepping stones for our yard. 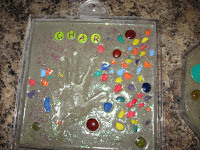 The girls had so much fun decorating them and putting their hands in the cement. William could have done without it. 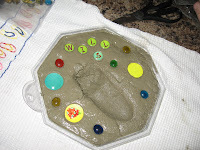 We put his foot in there to make the mold and his little toes curled up and made a large hole. They turned out so cute. These are the final products. 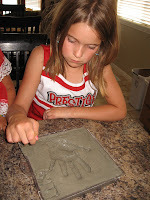 Now that they know how to do it...we have some molds to do the same thing here at our house...I know what they can do when the come to visit next time! Too cute. 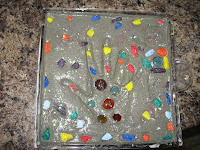 Where did you get the mold so darn cute! !